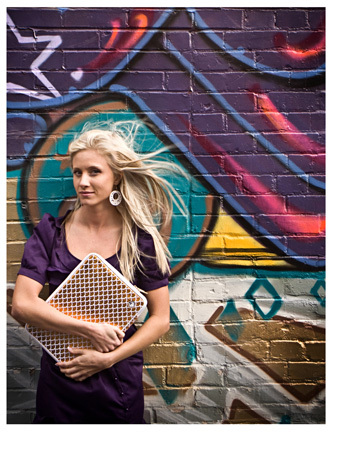 Switch is a technology life & style blog, which showcases innovative design, fashion and topics from a female perspective. Welcome to 2015. This is the 10 year anniversary of IHeartSwitch.com and it is befitting to start with a post about wireless connected rings. The connected ring was the first thing I ever concepted back at Parsons, but it was just a dream and a hacked together RF radio design. 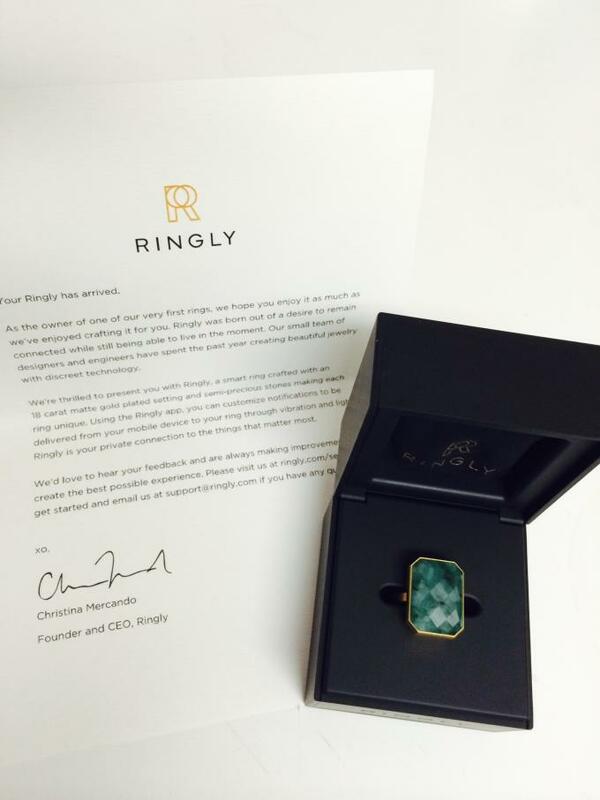 Now, in 2015, we have Ringly, a line of metal and stone rings that are elegant fashion jewelry, and much more. The Bluetooth connected rings vibrate and light up to notifications from your mobile phone. I got my ring before Christmas as a present to myself. When it arrived, the experience was like getting a gift. The product was wrapped nicely and I had to unfold the paper and open it up. Then, I pulled out a black jewelry box to see my little Ringly looking back at me. I purchased the Emerald and Gold one with a little diamond on the side. The jewelry box that holds the ring is actually its charger, so you don't have to figure out how to charge a tiny ring. You plug it into USB and there are two discrete metal prongs that connect the ring to the charger. It looks like a normal jewelry box. I especially adored the hand signed letter from the CEO, Christina Mercado and the gold plated metal on the USB charger. Nice touches. You my have noticed I've have not been posting regularly on iHeartSwitch for some time now. While iHeartSwitch is still my baby, I've been nurturing another venture. Now, for the first time in over a year, I can share it with you. 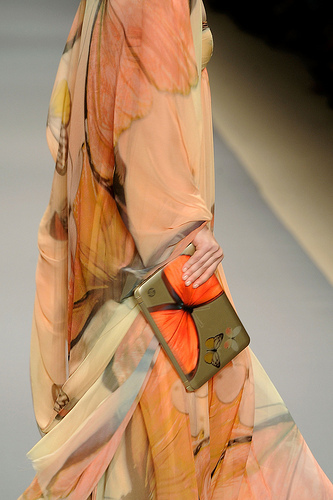 The company is Agent of Presence and we create high-end fashion accessories infused with technology. The Asian Tube TV Online Videos Blog features a video of the new “Necomimi” cat ears that convert your brainwaves into movements. The maker ”neurowear” uses a popularized cultish "CatGirl" style found in Anime and in street styles of Japan. The headband reads your brainwaves through various bio sensors which cause the ears to wiggle in response to your emotional state. If you don't feel like wearing your heart on your sleeve this Valentines Day, try wearing it as a necklace. 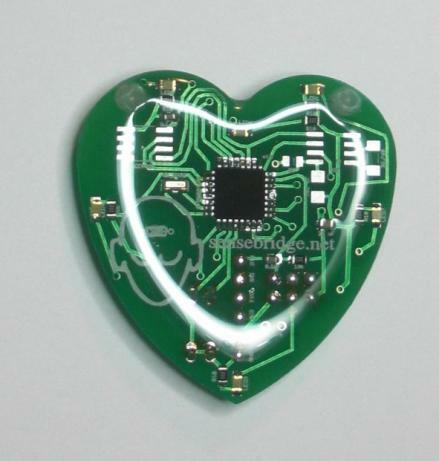 Eric Boyd of Sensebridge, designed this wonderful heart-shaped circuit that blinks with the beating of your heart. It reads from a Polar transmitter that you wear around your chest and shares your most intimate biological information with anyone watching. Terracycle, a company specializing in eco-friendly products, opened their Green Up Shop at the Port Authority in NYC. The products don’t incorporate circuits, sensors, or motorized parts, but they can provide you with some nifty ideas for upcycled materials and sustainable textiles. The creators of the products make sustainability look easy. Surely, you can step it up a notch and integrate some wearable tech! Christina Liedtke's fabulous couture gown is made from M&M wrappers. The pop up shop was supposed to end on May 1st, but it’s sticking around till May 21st. You’ll find vinyl billboard messenger bags, sustainable activewear, candy wrapper couture gowns, and a ton more upcycled stuff than you can shake a soldering iron at. Head over and grab some eye-opening inspiration. If you’re not in NYC, visit the Green Up Shop website (http://greenupshop.terracycle.net. My plastic snap-on laptop cover broke and I found myself in need of a new one. I came upon the ISIS collection, a design driven laptop and technology accessory company who makes their sleeves with memory foam. I usually go with the sleek plastic covers because they fit into a tight space and slide in and out of my bag easily, but as a lover of textiles, I really wanted a fabric sleeve and the ISIS is an excellent choice. I picked the Isis Dei Goldfish 15.4" Memory Foam Laptop Sleeve to go with my new Minx Gold Nails. Below, you can see the photos of my transition from the hard case to the ISIS sleeve. I think it's much more fashionable, don't you? Yet another luxury phone is coming to market. The Italian fashion house Versace plans to introduce its first in a line of mobile phones to the public in May. The phone will cost around $5,000 and according to their press release, will be crafted to the client’s expectations with the highest quality of materials such as leather. 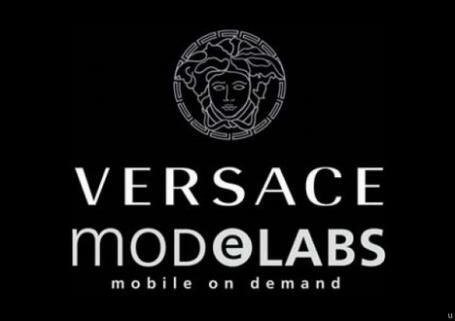 (ZDNet) Designed in collaboration with with ModeLabs, who creates tailor-made handsets for brands like Tag Haur and Dior, Versace follows in the heels of luxury branded mobile phones from Dior, Dolce & Gabbana, Prada and Armani. Luxury phones, such as these, are in high demand in Asia, Russia, and the Middle East, but honestly this launch just feels like hype. I guess if you have billions of dollars it makes sense to have a phone that represents your status and lifestyle, but I think telecom companies and manufacturers can do better than flashing up the exterior with leather and ice. Of all the luxury phones on the market so far, Prada and LG win the golden ticket. 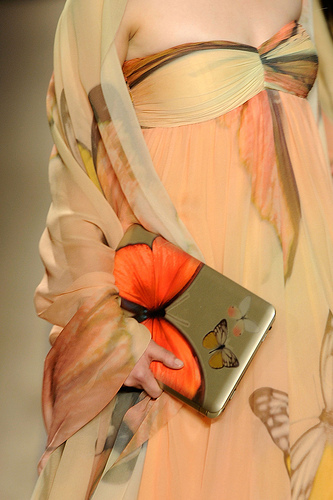 Vivian Tam's newest HP collaboration hit the runway Saturday with a stylish gold little "clutch computer." The newest photos are posted to HP's Flckr Photostream and you can watch her runway show on StyleCast. Don't foreget if you need a stylish computer to go with the saucy red shoes you've been dying to wear, pick up a red HP Mini from her 2009 collection online. Fashion technology is not all about "fashion." There are also serious use cases that may not be glamorous but serve the greater good. The just-announced GPS shoes for Alzheier's patients is one example. As you know, people suffering from Alzheier's may wander away from home and forget how to get back due to dementia. 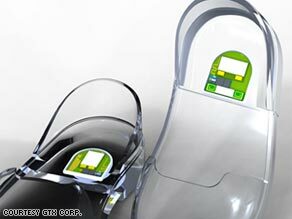 GPS shoes can help patients' families and caregivers to locate them in such a scenario. 2008 © I Heart Switch. All rights reserved. Subscribe to the Switch Blog’s RSS feed for the latest news, articles, and projects from Switch. Should you have questions regarding a blog article or a forum topic, we encourage you to leave a comment on that webpage. For questions about the projects that you see in our book, check out our Switch Craft page for information or post a topic in our forums.